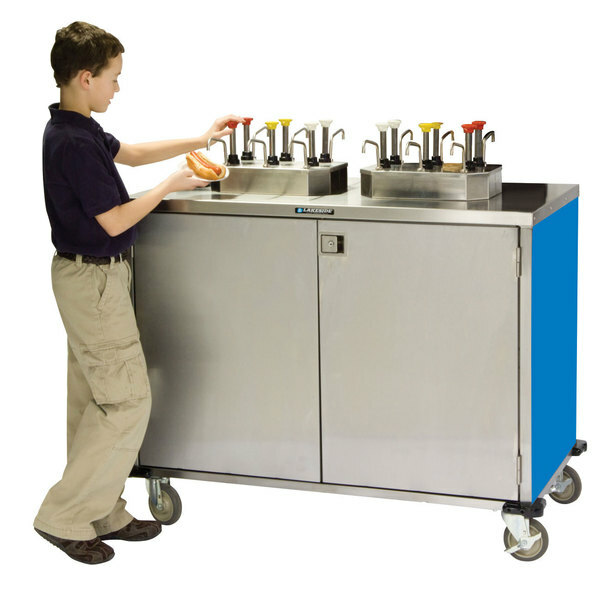 Lakeside 70210 Stainless Steel EZ Serve 6 Pump Condiment Cart with Royal Blue Finish - 27 1/2" x 50 1/4" x 47"
This Lakeside 70210 royal blue EZ Serve 6 pump condiment cart is the perfect solution to serving condiments in your cafeteria or school lunch room! This cart utilizes manual condiment pumps that eliminate the need for electricity or bulky CO2 canisters. The pumps may also be cleaned in place, so no disassembly is required. You can also be sure that your condiments are served in a safe and sanitary manner since this dispensing cart utilizes sanitary, sealed, disposable 3 gallon vacuum-packed condiment pouches. The use of a sealed dispensing system reduces the risk of contamination, plus the pouches are easier to handle than large cans. The included hose connectors fit most condiment brands and may be removed to facilitate quick cleaning and refilling. This cart rolls smoothly on its four tough-duty 5" swivel casters, and two of the casters have brakes to lock your condiment cart securely in place for serving. It's also convenient to access the cabinet through the hinged, locking front doors. The doors feature locks to protect your condiments from tampering, but the doors swing wide open for easy access. Plus, the stainless steel interior and exterior allow for quick and thorough cleaning. This condiment cart features an 6 pump design and can dispense up to 3 different condiments at once, and convenient lift-out bins inside the cabinet make it easy to remove and replace the condiment pouches. Lakeside 70200 Stainless Steel EZ Serve 8 Pump Condiment Cart with Royal Blue Finish - 27 1/2" x 50 1/4" x 47"
Lakeside 70270 Stainless Steel EZ Serve 12 Pump Condiment Cart with Royal Blue Finish - 27 1/2" x 50 1/4" x 47"
Lakeside 70220 Stainless Steel EZ Serve 4 Pump Condiment Cart with Royal Blue Finish - 27 1/2" x 33" x 47"